Google Inc. (GOOG) shares are trading sharply lower Friday after the Mountain View, Calif.- based company provided disappointing earnings results (missed on EPS but beat on revenues: EPS of $8.08 versus consensus of $8.10 ; revs were $6.54B, excluding TAC, versus the $6.32B consensus) that were pressured by higher operating expenses, climbing to $2.84 billion from $1.84 billion in the year-ago period. As a result, Citigroup (C) downgraded Google this morning to “Hold” from “Buy” and lowered its price target for shares to $650 from $750. In addition, Google’s PPS target was lowered to $680 from $720 at Caris, $700 from $750 at BMO Capital, $650 from $715 at Oppenheimer, $700 from $750 at Wedbush and at Credit Suisse Group (CS), and $750 from $775 at Stifel N. Morgan Stanley (MS) also lowered its price target on the co. to $645, but the New York-based investment bank said it is keeping its “Overweight” rating on shares. Not everyone however is lowering their GOOG estimates. [From MW] Heath Terry, an analyst with FBR Capital Markets, maintained his $750 price target and “Outperform” rating on the co.’s shares, noting that Google still has a leading position in the market. “Google is best positioned to benefit from the recovery in ad spending and overall growth in Internet usage,” Terry wrote in a note to clients. Jeetil Patel of Deutsche Bank (DB) went further by lifting his GOOG PPS target to $700 from $626 while maintaining his “Buy” rating. “Investors should track operating profit dollars, reflecting healthy top-line growth,” Patel wrote in a research note. From a valuation perspective, Google shares trade at a 5.85x on a price to sales basis. The ticker has a trailing P/E of 20.44, a forward P/E of 13.47 and a P/E to Growth ratio of 0.92. The median Wall Street price target on the stock is $750.00 with a high target of $800.00. 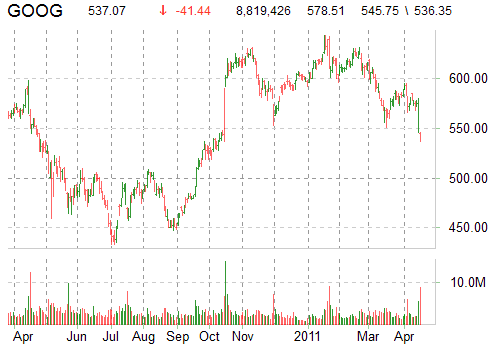 GOOG in late trading fell $40.90, or 7.07%, to six-month low of $537.59. The stock is off about 4.3% for the year-to-date. Ticker support is at $536.84 ; long term support is at $527.62. Volume: 8.4 million shares traded as of 1:11 p.m. EST vs 2.75 million daily (3m) average. The problem with Google is that they have no strategy, other than to capitalize on their advertising infrastructure. In other words, whatever the product they come up with, they have no sales approach other than to say “we give it away for free…”. And the result are antitrust claims from competitors.